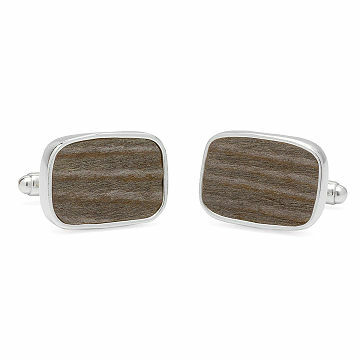 These cufflinks are made with real fragments of famous college football stadiums. Take a champion college team out on the town with these collegiate football stadium cufflinks. Made of material salvaged from original seats from your gridiron arena of choice set in sterling silver bezels, they"ll give your college football fan a handsome alternative to wearing his team's jersey for your Date Night. The colors and textures will vary, making each pair one-of-a-kind, and all are sure to look better with a suit than a team helmet would. Made in Mexico. Clean when needed with a jewelry cloth.